The Ron Paul Media Blackout continues. 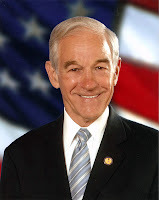 Last night's GOP presidential debate lasted 3,600 seconds (60 minutes) and Ron Paul was only allowed 90 seconds. Of the eight candidates on the stage, the "average" candidate should have 450 seconds - of course Romney, Cain, and Perry had far more, reiterating the same Bush/Obama talking points of occupation and neo-colonialism. Ron Paul only got 20% of his fair air time! Some of my liberal friends seems puzzled or even outraged when I state my support for Ron Paul as president in 2012. But it's really not complicated.